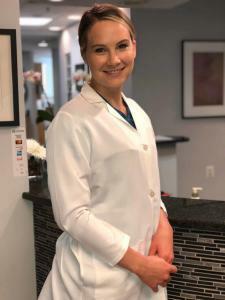 Dr. Kristen Graham practices biologic dental medicine, which incorporates the principles of functional medicine along with science of biologic and functional dentistry. Dr Graham graduated from the University of Maryland School of Dentistry. She started early down the functional path when she co-authored on a paper while at UMSOD on Bis-Phenol A, published in the Academy of General Dentistry in 2012. Dr. Graham continued her post-doc education by attending The American College of Integrative Medicine and Dentistry becoming board certified as a Naturopathic Physician, as well as in Integrative Biologic Dental Medicine. She has completed additional certifications in ozone therapy and Invisalign. She has advanced training from the Institute for Functional Medicine’s (IFM) Applied Functional Medicine in Clinical Practice, and is pursuing her certification with IFM. In addition to practicing dentistry, she has a health consulting practice working with patients one-on-one helping them bridge the gap between their oral and systemic health by focusing on GI health. She has personally struggled with an autoimmune disease (ulcerative colitis) and has used functional comprehensive approaches to heal herself. She believes gut health is vitally important to the well being of every human being, and the importance of remembering it starts in the oral terrain. She loves working with patients one-on-one helping them achieve their optimum wellness head to tail through her consulting practice, and in clinic as a biologic dentist. In her free time she loves reading research, cooking, yoga, and spending time outside with her husband and two Rhodesian ridgebacks.